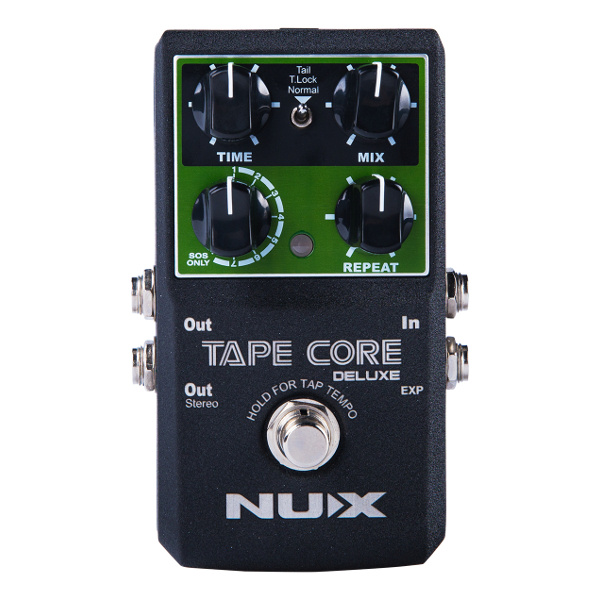 Nux Tape Core Deluxe Tape Echo Pedal., Newark Musical Merchandise Co.
Here’s how the original Tape-Echo Machine worked: The Recording Head (which is not needed in our digital version) is on the far left. The ones to the right are what we use to digitally recreate the sound using TS/AC Technology. As in the original version, 3 Repro-Tape Heads allows for 7 different combinations. The distance between the Repro-Tape Heads determines the delay sound. Want to customize your Tape Core Pedal? Experience Tape Core Editor by going to: www.nuxefx.com and download the software. And remember to use DFU to update the firmware (bin) so you can enjoy the ultimate Tape Core Editor experience! You can edit in Real-Time or Note Pattern mode by using the SYNC slider. This allows you to use actual musical notes to create an infinite combination of groove patterns. This is used to re-assign your 7 Combinations, turn On/Off the AUTO TAP, and/or KILL DRY functions. 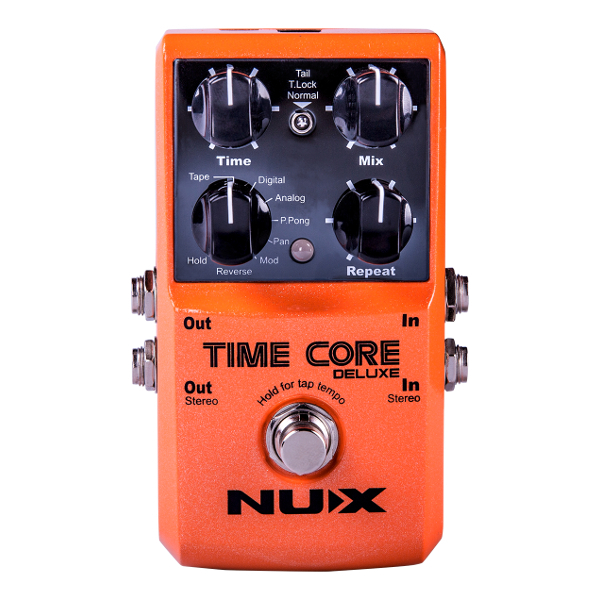 You can use this function to turn On/Off NUX’s patented Smart-Tap Tempo. When not using Smart-Tap Tempo you need to HOLD your foot-switch 2 seconds and wait for LED indicator light to change color then TAP your speed. With Smart Tap Temp, just start TAPPING, and it automatically knows that anything past 2 TAPS is your desired tempo. Dry meaning “ NO EFFECT” and Wet meaning “WITH EFFECTS”, there are situations where you need to “Kill the Dry”, for example: if you connect Tape Core Deluxe to an amp that is already running both the Wet and Dry signal in Parallel ( side-by-side ). The KILL DRY switch allows you to turn On / Off your Dry signal so there are no signal conflicts. The original Tape-Echo Machine had adjustment dials that allowed you to tweak some additional parameters: WOW, FLUTTER, BASS, REVERB, SATURATION and TREBLE. So, to get as close to the original as possible, we included them! Effects: 7 repro head combination types and Sound on Sound type.